We all have a favorite wedding lehenga color, the color in which we we look our best. Most of the times, the lehenga you love may be awesome in print, design or color…but mostly all these features don’t come in the same package. If you like the color of one, the work is not that good. If you like the gher of other, the fit doesn’t suit you and so on. Its a miserable time for any bride to be. We have been through it all, and its honestly quite tiring and frustrating. Why can’t there be that one dream lehenga which is just perfect to the t. It becomes all the more troublesome when you’re budget is not in the Sabyasachi range…when customization is not an option. What to do? Choose-off-the-rack is a serious issue which most of us face in the best of the best brand stores. I faced the same. After what seemed like zillion shopping trips I finally came across a lehenga which I thought was closest to my dream imagination…everything was sort of perfect except the color shade. I had my lehenga priorities in place. I knew poofyness was my single biggest factor, and I wanted full work at a affordable budget of course. While I got everything…the color was peach. Not pink, not baby pink and not fuschia…but peach. While peach looks amazing in person, and is the color of the season ever since Anushree Reddy came up with her floral lehengas, peach looks rather bland in pictures. Especially when you know others (wedding guests, relatives, friends etc) are going to come super dhin-chak to your wedding. I was in a serious dilemma. It was close to October end when I finally found this one lehenga, and my wedding was scheduled for December 1st week. I really didn’t have much of an option but to decide fast. Was I going to be happy the next day after taking the plunge, did I do the right thing? Is color more important than the look of the lehenga in terms to work and poofyness? I think I took the right decision to pick it up. You see, color shade is something one can work with but not with the other priorities. You cannot make a lehenga super poofy if it doesn’t have that much cloth or add work on it to your satisfaction without blowing up your budget. Color is something one can work with. Ask me how? Photographer + Photo-Editing is the answer. Nowadays magic happens through photo-editing, we all know that…so I want you to remember that its always an option. You can easily get your outfit to downplay the colors or add a pop to it…its all possible, and its all ok. After all its your wedding. You can get away with whatever you want. All those pinterest perfect pictures, its not always natural…a lot of work (read editing) goes in to make it look pinterest worthy. If you have a good photographer, then you need not worry. You are in good hands. Have a look at how drastically a color shade can transform. If you think you can get away with changing pink to orange, that would be hoping for too much…but a few shades up or down is totally possible giving you the perfect paper print shade that you love. I honestly was not expecting this. I was so surprised with a twinkle in my eye. I was happy. I wanted this exact shade, and I hadn’t even mentioned it to my photographer. He just happened to edit it that way. Just to make that bridal lehenga purchase a tad bit simpler for you. 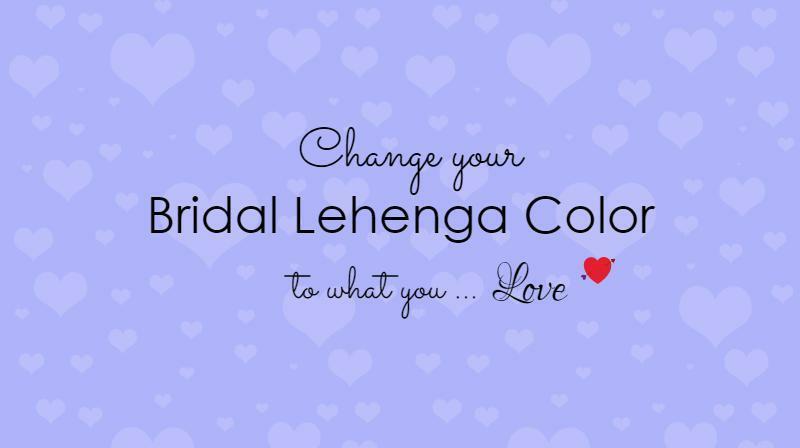 If color shade is the only thing that’s stopping you from picking your dream lehenga, you can simply check with your photographer if something can be done about the color. Just explain what the color is like if you can’t take a picture of the lehenga, and ask him what color you really want it to be. A lot of times we see in stores that a not so perfect lehenga is priced much much lower than a slightly better looking lehenga. If your budget doesn’t permit you to make that splurge, this is probably the only working alternative with which you can get away looking like a stunning bride. I just have my bridal lehenga picture as an example, but if you guys have had similar experiences do share below.